The West End & Highlands Montessori Schools provides a child-centered learning environment that allows preschoolers to work in groups or individually without distractions. Dr. Maria Montessori noted that children learn from experience and interaction with their environment. Self-correcting didactic materials are available and are designed to stimulate logical thought and discovery. Educational theories show that learning begins as an individual process which quickly progresses when observation of peers and indirect exposure to more advanced subjects is included. Even though a majority of schools are organized by single age grouping, research has not effectively proven this to be maximally beneficial. The Montessori system groups children by ability and age which improves relationships between all students and improves classroom unity. The Montessori Method supports multi-age grouping and at West End Montessori, children are grouped in mixed ages and abilities from ages two to six years old. We provide opportunity for constant interaction, child-to-child teaching, and socialization. Our unique curriculum introduces lessons simply and concretely and reintroduces the lessons at increasing degrees of abstraction and complexity throughout the school year. The Montessori program provides blocks of uninterrupted work time to allow children to repeat lessons and arrive at new ways of completing. 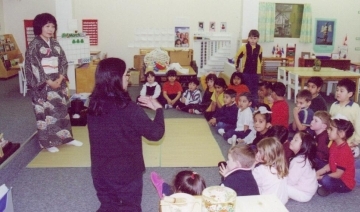 This integrated approach to education is one of the Montessori program's greatest strengths.